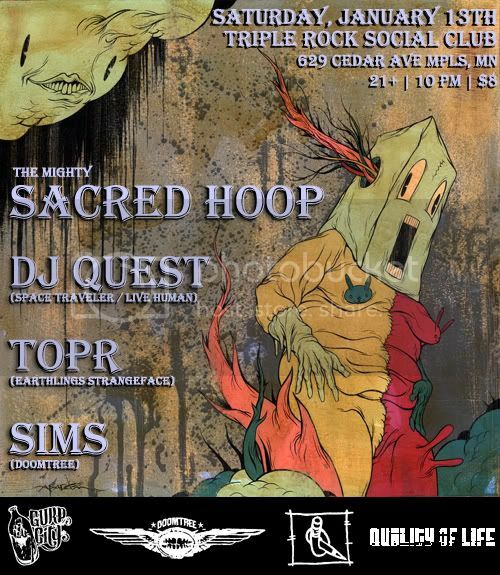 Sacred hoop and Lord Top Ramen are bringing their debaucherous ways to the Midwest, as well as the great DJ Quest. if you’re in the area be sure to make the drive and check them out. Don’t forget to hit the ATM beforehand to get some extra cash for cds and shirts. Now Topr and The Hoop will definately put on a dope show. but if you need a lil more convincing, seeing DJ Quest wreck shop is well worth more than the price of admission. Check out a lil snippet from Quest’s routine at a Topr show a few months back.